What is a total work of art? Those familiar with Richard Wagner will jump in first to correct the English with the German “Gesamtkunstwerk” and describe, starry-eyed, Wagner’s vision of a totalizing performance space in which all the arts—architecture, music, poetry—are perfectly fused. 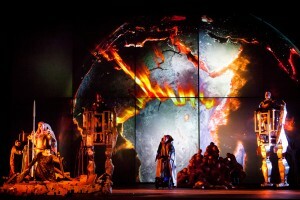 But Houston Grand Opera’s Das Rheingold, a co-production with Palau de les Arts Reina Sofia, Valencia, and Maggio Musicale, Florence, makes me wonder if we ever really understood a total work of art until now. Extraordinary doesn’t even begin to describe the experience. 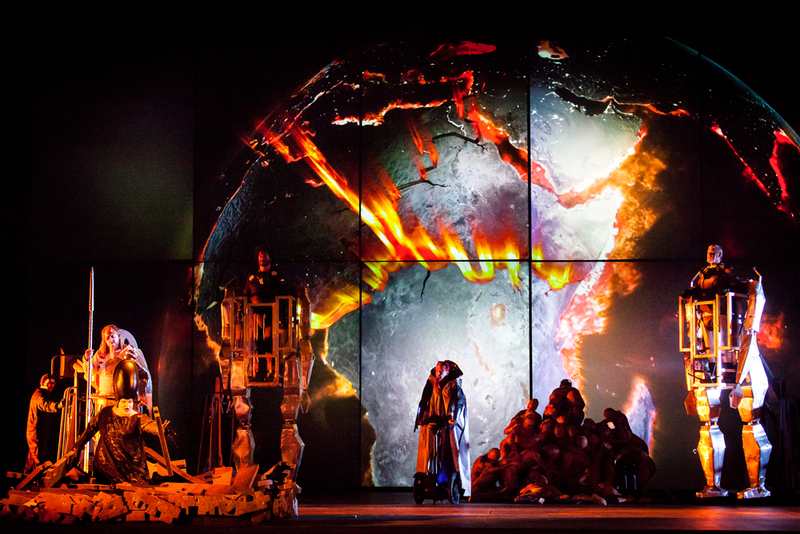 Das Rheingold is the first in Wagner’s epic tetralogy, the Ring Cycle. This opera lays the narrative foundation. As its title suggests, Das Rheingold establishes where the magical gold originates, how it gets forged into a powerful ring, and how it portends the inevitable demise of the gods and Valhalla. What you might not expect, though, is that this production also establishes that the two giants, Fasolt and Fafner, are supported by 800-pound cranes that come from the same metal shop as Sigourney Weaver’s fighting machine in Alien, and that Loge, the god of fire, is a devil with a Segway. Don’t be surprised to find yourself pondering factory farming as golden forms, hung by their heels, are rolled across the background in an assembly line or reminiscing about the Matrix as golden embryos are packed and sealed against a complex set of data and industrial piping. And I haven’t even gotten to the acrobatics, fire breather, and flying fish tanks yet. Individually, these elements would be strange (although Loge on a Segway is a stroke of genius no matter what). What set designer Roland Olbeter, costume designer Chu Uroz, lighting designers Peter van Praet and Gianni Paolo Mirenda and video designer Franc Aleu have made together is no less than a visual artistic masterpiece. Architecture: check. The vocal cast is a power house. The three Rhinemaidens, Andrea Carroll, Catherine Martin, and Renée Tatum, open the opera with a trio de force while still managing to seductively splash around in square, suspended tanks. Baritone Christopher Purves, in the role of the unsightly Alberich, dances around below them while exemplifying vocal agility. As Fricka, mezzo-soprano Jamie Barton tears it up with a voice full of passionate steel. Iain Paterson reigns as Wotan with a mighty bass-baritone—forceful and commanding. Most memorable of all, tenor Stefan Margita offers an invigorated interpretation of Loge, and it’s not just because he’s floats around the stage on mechanized wheels. Costumed in a shiny white cape lit up with red LED bulbs, Margita leaves an impression. Das Rheingold is the only opera of the Ring Cycle in which Loge plays a major role (later you’ll briefly see him set a ring of fire around Brünnhilde and, later still, light up Valhalla), and it’s a shame. Margita sings purposefully without it feeling purposeful. He is such a good performer it is easy to forget he’s acting. The tenor timbre that so rarely even borders on the fullness that baritones achieve, is, for Margita, a given of breadth and sophistication. I’m tempted to say he is a total work of art himself. And the orchestra, conducted by the indefatigable Patrick Summers, captures Wagner’s ideal: although there were a few horn blunders, I hardly cared because the score was practically unnoticeable as a separate entity. Music: check. But the most pressing reason this production redefines Gesamtkunstwerk is that there is poetry in the experience I can’t put into words. It envelopes you and transports you to another land in another time as only a true total work of art can. Das Rheingold runs April 11- April 26, and many shows are already sold out, so book it now and don’t miss this singular production. Thank you for your honorable mention and feedback! There is not many opportunities for a firebreather to get recognized in the public domain and this is truly an honor and a pleasure to be a part of such a monumental, historical production with an institution like the Houston Grand Opera.